Gosha Rubchinskiy has become one of the most influential voices in menswear producing collections, photo-books, and even a 17-minute silent film, all of which have earned him a host of followers. In his work you will find many references to youth culture, the internet and of course, Russia. 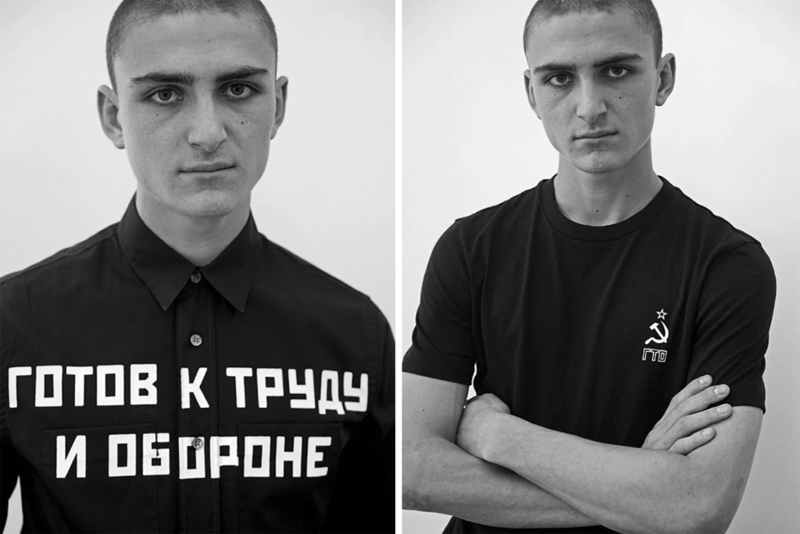 shirts with Cyrillic message are from his spring summer 2016 collection. ГОТОВ К ТРУДУ И ОБОРОНЕ, often abbreviated to just ГТО, was the Ready for Labor and Defence program, an initiative designed to involve citizens of the Soviet Union in sports and exercise. The print appeared on SS16’s shirting and tees, while the collection as a whole was dominated by sportswear themes – most notably with track jackets, striped vests and athletic shorts. explanation from high snobiety. go for more meanings behind to their site.